so a while back I had my steering wheel covered by Jack at Royal Steering Wheels. I had it one layer of leather thicker that standard - looks completely factory just a touch thicker. I've used the car embarrassingly little over the last year having move house several times in recent years, but now finally settled I'm back in the 993 and loving it. £450 - either collection from SL7 or happy to post at cost. 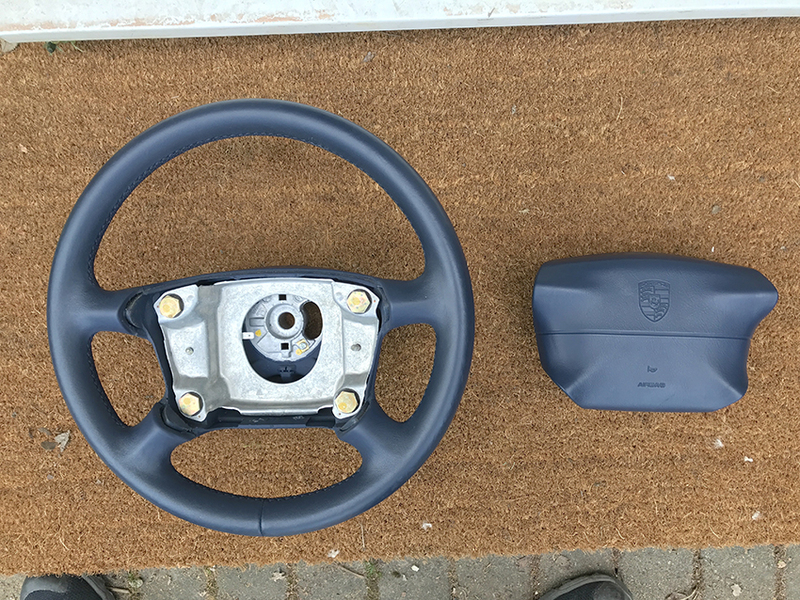 Please do let me know if the price is completely off for a recently re-covered mint wheel. So what do you think about the leather thickness?, which do you prefer?. I've been out in the car all morning and I think I prefer the latest version thickness, but time will tell! I'm sure I have a black 993 wheel somewhere - must list that as well as it's no good to me sat in a cupboard! Hi mate, could I ask how much for retrim?. forgot to say that you have to post it there and back. Royal isn't too far from me so I dropped it off and then collected. is this of interest to anyone? before I forget about it and it goes in a cupboard somewhere! Blue in a 993 has always been a tough sell which is why it's taking a while IMO. 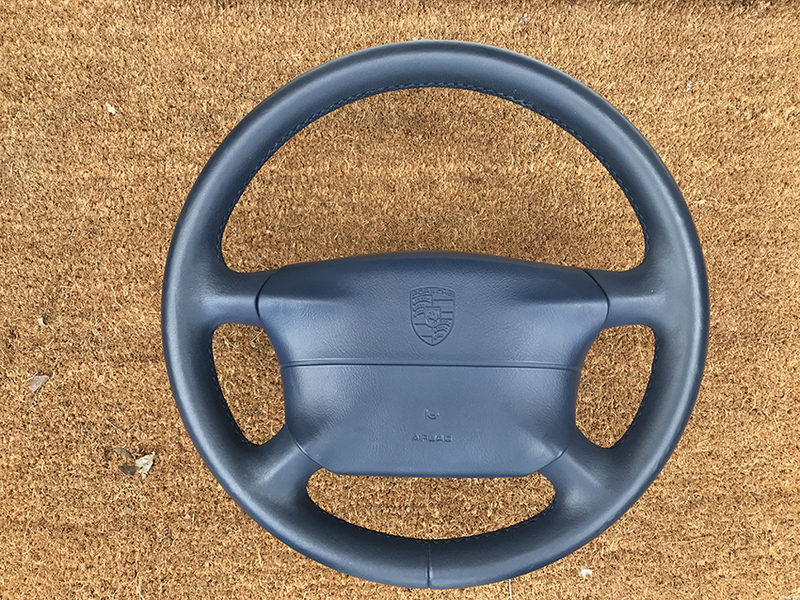 A lot of 993 owners swap the 4 Spoke out for the 996 3 Spoke Wheel and typically with any German manufactured car from this era, the interior colours tend to be a little OTT (too much of one colour)... hence opting for a Black Wheel to break the colour up. My advice would be to list it on ebay with a well written advert and lots of pics. List it as an auction as this is the only way it will find its true value. I think you are right - although as is the way with these things when you are looking for something yourself they seem to have gone up in rarety and value yet when you come to sell something there is little to no interest!! when I get a chance I'll take a load more photos and list it on ebay. Anytime Ben and fingers crossed you get a good price for a good wheel. Hi Ben, I would have been interested in the wheel alone to be honest as my wheel needs a refurb and this would have been an ideal replacement however I don't need the airbag. Although to be honest I’d rather sell them both together. how about £200 for just the wheel? Similar situation in that my air-bag is mint but steering wheel could do with a refurb. thanks for the offer, but it makes no sense to sell the wheel for the less than the refurb costs, not including the cost of the wheel which in itself is of similar value to your offer. If you would like my spare black wheel for £200 then you are welcome to it!